Soup, Bisque, Stew and Chili – Don't Forget the Cream! My favorite time of the year for cooking and eating is Autumn. Our gardens have produced their crops and the fall gourds are in season. This recipe combines sweet butternut squash, the crisp tart-sweet apple and onion into a rich creamy – and quick – soup that can be ready for the table with relative ease and only about 15 minutes of prep time. Top with a bit of Creme Fraiche and toasted pumpkin seeds, sit out on your lawn and enjoy it while watching the crisp leaves fall from the brightly colored fall trees. Heat oven to 350 degrees. Melt 2 Tbsp. of butter. Place the cut butternut squash in a large bowl, pour 2 tbsp. of butter over the squash and mix. It is important that the squash is at room temperature, if the squash is cold, the butter will not coat it properly. Place the butter coated squash on a parchment lined baking sheet and roast for 1 hour or until fork-tender. Remove from oven and reserve. In a heavy pot, melt the butter over medium heat. As soon as the butter is melted, add the onion and ginger and gently cook until the onion is soft and translucent, about 2 minutes. Add the apple and cook until the apple is thoroughly warmed and the ingredients have combined, another 3 minutes. Add the roasted butternut squash and the apple cider or cider beer and bring to a simmer. Add chicken stock and again bring to a simmer for about 5 minutes. If you have an immersion blender, put it in the pot and thoroughly blend all of the ingredients right in the pot. Add the cream and stir to incorporate. Salt and Pepper to taste. 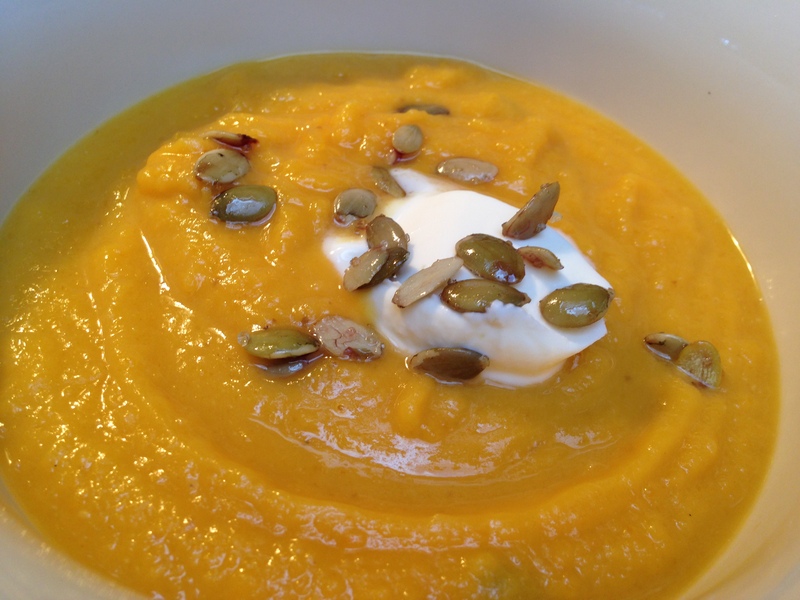 To serve, top the soup with Creme Fraiche and toasted pumpkin seeds. In a small bowl, combine the seeds with the pumpkin seed oil. Spread the oil coated seeds on a parchment lined baking sheet and salt with Kosher salt – give the space to roast, no crowding please. Roast for 15-20 minutes or until you begin to smell the seeds and they dry a bit in the oven. Remove and enjoy. Store in a jar with a paper towel on the bottom to keep the seeds fresh.